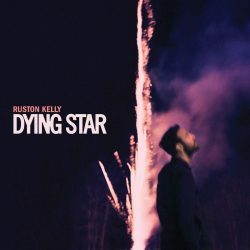 Ruston Kelly may not yet be a household name but with the release of ‘Dying Star’ that may all be about to change. Kelly spent his teenage years moving with his family across various US states before ending up for a while in Belgium before returning to the US and heading to Nashville. He initially came to the fore as a songwriter, composing songs for the likes of Tim McGraw before beginning to establish himself as a solo artist in his own right. Kelly really started to come to prominence in the spring of 2016 when his song ‘Black Magic’ was used in the season 2 TV finale of the hit CBS series Scorpion, instantly bringing him to the attention of a wider public, particularly in the US. His subsequent marriage to country music star Kacey Musgraves, combined with the release of his well-received 2017 EP ‘Halloween’ heightened that recognition and now with the issue of his debut album ‘Dying Star,’ his profile will certainly continue to expand. So, after that very swift background summary, how’s the album you may well be asking? That’s a tough one to answer. On first listen it’s seemingly pretty dark and peppered throughout with tales of addiction, broken relationships and total despair at life in general. However, all is not as it initially seems. Listen more deeply to the lyrics and it soon becomes apparent that this certainly isn’t an album that falls into the trap of delivering nothing but clichéd tales of personal anguish and misery. Taking inspiration from the chaotic times in his past where he readily admits to some very poor life choices, Kelly has crafted an album which at its heart is about hope, salvation and the eventual road to redemption and happiness. It’s really not dark at all; it’s actually quite life-affirming. Throughout the album he consistently shines a light into the dark recesses of his past and lays it bare for all to see, with songs like ‘Mercury‘ and ‘Blackout‘ replaying the darkest periods from his past. Cleverly, though, the messages change and the title track ‘Dying Star’ isn’t, as you might expect from its title, a tale about flaming out and subsequent death. It’s about a new beginning, a rebirth – reached after Kelly recognised that he was barely existing in a personal hell of his own making. There are 14 melodic and well-crafted tracks on this album and Kelly is clearly a very skillful songwriter and he has been well served on ‘Dying Star’ by co-producer Jarrad K who also contributes with backing vocals as well as 12 string and electric guitars. Kelly, though, is front and centre with guitar and lead vocal while the backing provided by the likes of Abby Sevigny along with his wife, Kacey Musgraves, are at times really quite mesmerising. It may take a little effort to fully grasp the full meaning of the messages in the songs but it is a really good debut album that gets better on repeated listening and is destined to gain him a whole new set of fans.